This exquisite heirloom lace overdress was originally part of a grand Belle Epoque silk gown, which unfortunately did not survive intact. 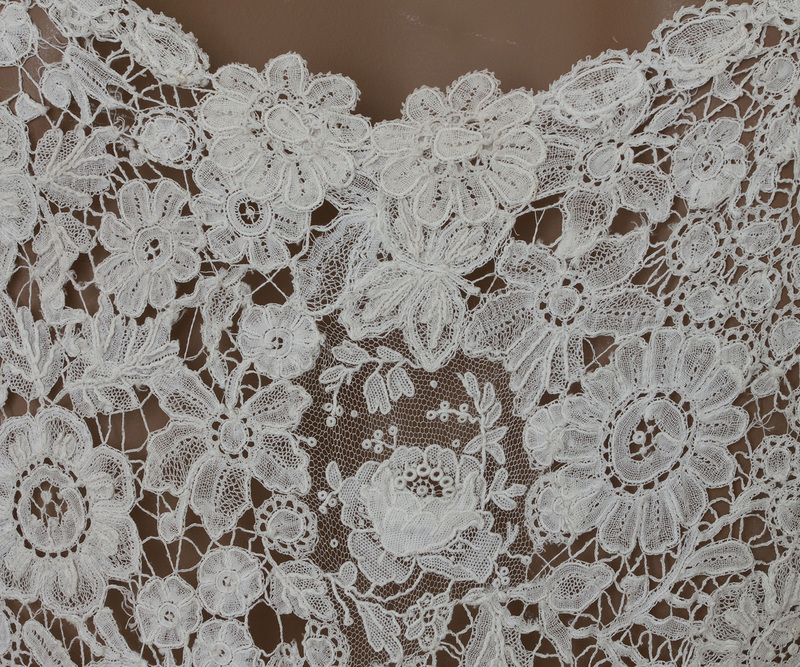 Because of the aesthetic and monetary value of Brussels lace, it was handed down through the generations, whether as separate pieces or as part of an altered garment. A large piece of fine Brussels lace is itself a sought after collectible. It is very rare to find an entire dress made entirely from antique Brussels lace—as delicate as the skeleton of an autumn leaf. 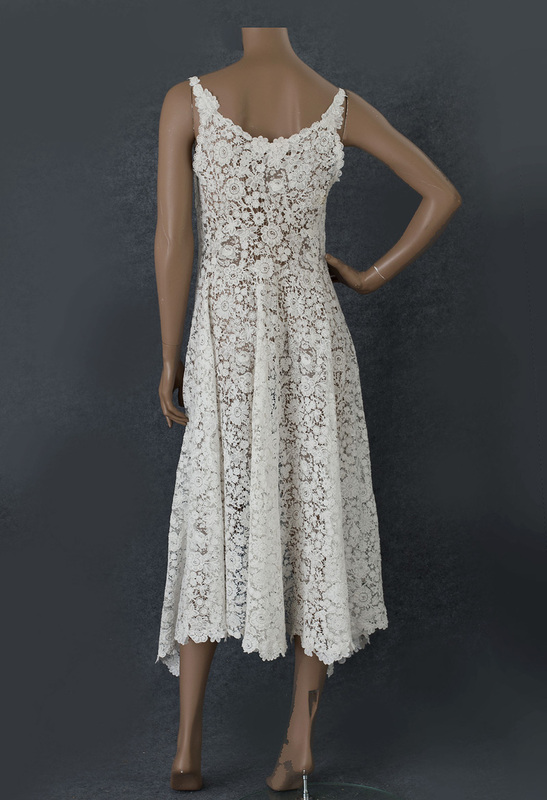 In its current incarnation, our lace overdress can be the core of a unique wedding ensemble. In the original Belle Epoque version, the full back of this lace skirt spreads out over a full silk underskirt. Thus every detail of the handmade lace in the overdress is beautifully displayed for the viewer. You have two choices for an underdress. You can find or recreate a period underdress. For a more modern look, you can pair our magnificent overdress with a plain strapless sheath. If you spend $500 for the underdress, your total cost would be $3,700. The overdress is also a fantastic buy (see below), giving you the visual effect of an heirloom lace garment without the higher cost of a complete Brussels lace dress. The overdress closes on one side of the front panel with small hooks. 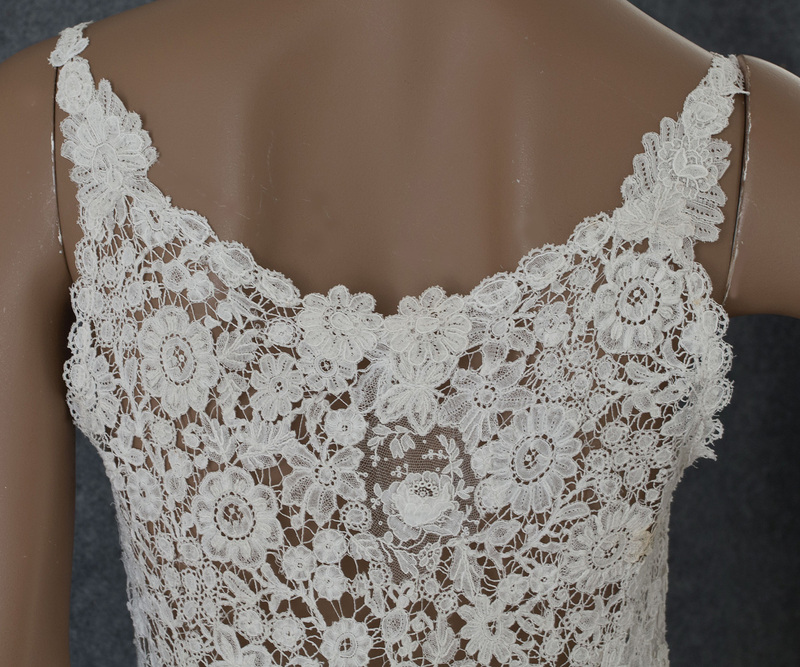 The front opening, neckline, and hem are bordered with appliquéd flowers of Brussels lace. I love the dramatic uneven hemline. Our dress recalls Kate Middleton's royal wedding dress. That dress and this one were both created entirely from handmade lace: in ours—19th century Brussels lace; in hers—modern French Chantilly lace and English Cluny lace. Kate Middleton's dress cost $390,000 vs. $3,200 for ours or about $3,700 with an underdress. The condition is almost Excellent. The color of the lace is slightly uneven. This is not a flaw but rather an emblem of the antique charm. It measures: 36" bust; 43" center-back length; and 54" from shoulder to front-hem points.